Details: On Sunday, May 21, 2017, at 8:20 PM, Corcoran officers were dispatched to the area of the 1800 block of Letts Avenue for a shots fired call. Officers were told the suspects were possibly in a tan Chevrolet Blazer. Officers conducted a search of the area and did not find anything struck by gun fire. Officers later located a tan Chevrolet Blazer and conducted a traffic stop on it in the 25000 block of 7th Avenue. Officers contacted two male juveniles, (ages 16 and 17), and two adults, who were identified as Salvadore Rangel and Maurice Hernandez. 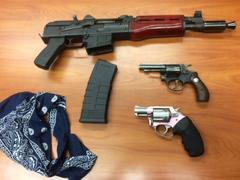 Officers conducted a search of the vehicle and located two revolvers and an AK-47 assault rifle with ammunition. One of the revolvers was determined to have been reported stolen. All four subjects were arrested and booked into the Corcoran Police Department Jail. 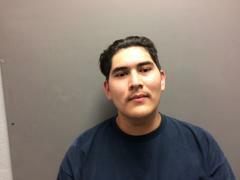 During an interview, one of the subjects admitted to discharging the rifle and being an active gang member. 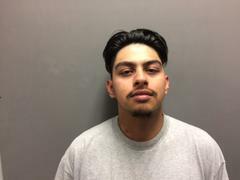 All four subjects were booked into the Corcoran City Jail for the charges of possession of an assault rifle, possession of a loaded firearm, possession of a concealed firearm, participation in a street gang, and possession of stolen property. The juveniles were booked into the Kings County Juvenile Center. Rangel and Hernandez were latere booked into the Kings County Jail where their bail was set at $155,000.00.